Comforters lined with cotton should have an even layer of cotton batting between the two sheets of fabric, but over time the cotton can become balled up. This leaves some parts of the comforter uncomfortably heavy and hot while other parts are nearly bare. Take the time to fluff a comforter up to its full capacity. This makes the comforter far more cozy to sleep in and use. Care for your cotton comforter to keep it in good shape. Rotate the comforter every morning. Part of what causes the cotton to become balled up is your movement at night, so rearrange which parts bear the brunt of your motions. 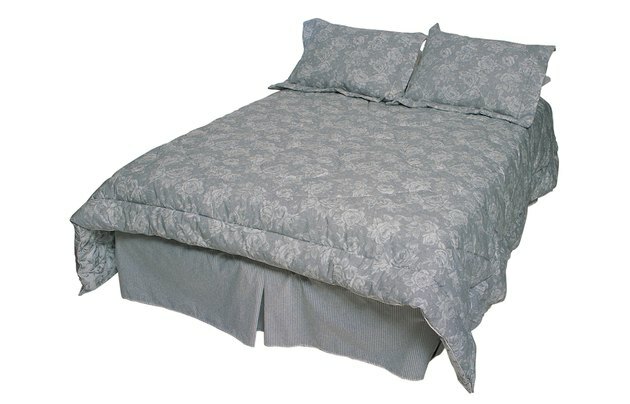 Shake the comforter out by grasping one edge firmly in your hands and flapping the comforter up and down. This helps redistribute the cotton in the comforter while also airing it out. Hang your cotton comforter over a clothesline and beat it soundly with a mattress beater or a carpet beater. This shakes out any dust as well as redistributes the cotton. Place the comforter in the dryer and dry it on low heat. Place two or three clean tennis balls in the dryer with the comforter to pound it into shape.